After The Truth about Stories, I re-read The City of Words to once again focus my mind away from such questions as “why does milk taste funny after eating a slice of pineapple?” This marks the third time I’m writing about The City of Words on this blog. There’s just so much there to discuss. I’ve come to realize that major part of why I liked The City of Words so much has to do with the author’s background. Alberto Manguel was born in Argentina, but immigrated to Canada in 1982 and thus speaks from the immigrant experience. Like me, he has navigated his fractured identity through literature and writing. I’m not sure how many immigrants actually deal with identity this way; it’s one of those things that might make Manguel’s work appealing to me, but probably outside the experience of others. Alberto Manguel, The City of Words, Toronto: House of Anansi Press, 2007. It’s become a cliché to call a book “thought-provoking” these days. Just about any non-fiction book gets the label. Yet I think there’s a big difference between a book that provokes thoughts of your own, and one that tells you what to think. 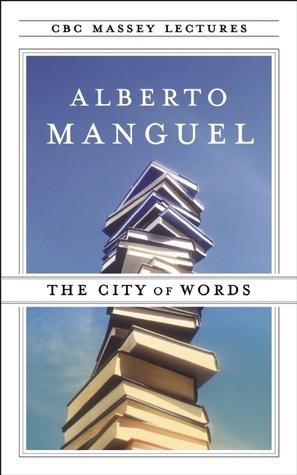 I’m going to use the former definition, obviously, and so I can say without much reservation that The City of Words by Alberto Manguel is the most thought-provoking book I’ve read in a long while. Perhaps because Manguel raises plenty of questions, but provides few if any answers (as we might say, it’s the Question that’s the thing). Some people are going to be frustrated by this, but Manguel’s roundabout way of dealing with the subject illustrates something pretty important about literature as a whole and its relationship with society: stories change us by opening up multiple avenues of thought, allowing for multiple readings and interpretations by which the experience of the author and the experience of the reader intermingle in a rare way.